Before I dish on the McDonald’s Happy Meals giveaway (you know you want to win), let’s start with the basics. As parents, we know our children’s health is a big concern. That’s why we pay such close attention to what we feed them. Sometimes after a long day of school work, swimming lessons, soccer practice, more work, etc., we need a quick meal… but we also don’t want to feed our children foods that contain harmful and artificial ingredients. I recently had a chance to sit down with some local McDonald’s franchisees in South Florida to discuss McDonald’s new and simpler Chicken McNuggets, as well as McDonald’s commitment to provide healthier and natural foods to its customers. The three franchisees, two moms and a dad, explained how they have seen McDonald’s evolve over the years as they grew up in the business. Visiting and touring a local McDonald’s was interesting for a few reasons. It may sound silly, but my biggest take away was learning iceberg lettuce is very low in nutritional value! For this reason, McDonald’s has said goodbye to iceberg and hello to kale and spinach – some of the most nutritious salad blends! Now, keep reading for an announcement from McDonald’s, more info about the McDonald’s App, and for the giveaway! rolling out new buns this month that no longer contain high fructose corn syrup, including the buns used on Big Macs, Quarter Pounders, hamburgers and cheeseburgers, Filet-O-Fish and McChicken sandwiches. The Artisan roll introduced in 2015 never contained high fructose corn syrup. Click HERE to read the full announcement about all of their new developments. You can Discover Delicious Deals by downloading the McDonald’s App. The app offers both national and local deals. Get FREE 4pc. 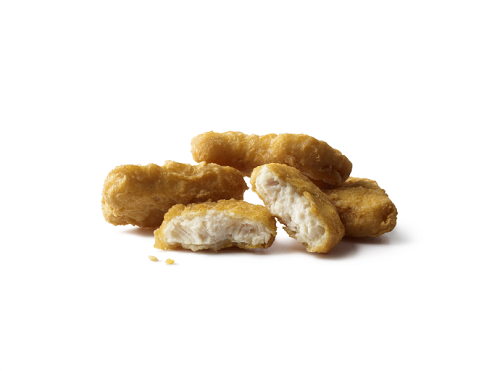 Chicken McNuggets, made with no artificial flavors or colors and now no artificial preservatives, with purchase of Large Extra Value Meal® when you use our App! Buy 5 McCafé® beverages, get 1 FREE! South Florida Moms: We’ve Got a Giveaway For You! 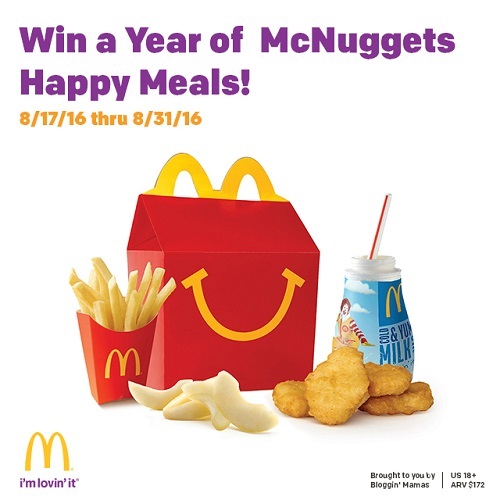 Enter now to secure one sweepstakes entry for your chance to win McDonald’s Happy Meals featuring the new, simpler Chicken McNuggets every week for a year*. Additional entries will go up for grabs—by following @McD_SouthFLA on Twitter or by downloading the McDonald’s App to Discover Delicious Deals. *Free McDonald’s for 1 awarded as 52 McDonald’s Happy Meal “Be Our Guest” coupon cards to be used once every week for a year . Redeemable only at participating McDonald’s in Miami-Dade, Broward, and Monroe County. I’m required to disclose a relationship between my blog and McDonald’s. This could include me being provided with content, product, access, service or other forms of payment.